I've been roasted by a dragon, used as a pincushion for ghoul spears, and hacked to death by an axe knight, repeatedly. I keep trying, and I die and die again. Are we having fun yet? No, actually, I'm not. I've been playing Demon's Souls — a game even its developer admits isn't "a fun game." The action-adventure game casts you as a hero confronting where progress is hard-won, recovery supplies are limited and equipment can wear out. The twist is that when players die, they return as phantoms to navigate the same environments in a weakened state in the hopes of earning their bodies back — that's right, the game actually gets more challenging the more you fail. I can't stop playing, and I can't really figure out why. Aren't games supposed to be accessible, and isn't frustration supposed to be a killjoy? What's the allure in this difficult game? Expanded audiences and accessibility are major watchwords in the present era of gaming. Microsoft Game Studios' Bruce Philips recently unveiled research at Gamasutra showing that even among Xbox 360 games where completion rates are highest, most users only get about half the potential Gamerscore. And 30 percent of users don't finish some of the most popular and widely-played titles Philips studied. His theory – and that of numerous other designers crafting games designed to be appealing to wider audiences – is that frustration is what makes players give up. But even though I'm definitely frustrated with Demon's Souls at times, I'd say I'm even more driven to succeed and to conquer than I've been in a long time. What gives? "I do not think that games must be accessible to be appealing," Demon's Souls producer Takeshi Kajii told me in an interview. "If you make a game accessible it will expand the audience. However, if we were to make all games accessible, wouldn't you eventually get tired of the same thing?" Kajii explained that in creating Demon's Souls the team sought to return to the core of what's fun about games, and relied on three tenets: challenge, discovery and accomplishment. "People commonly say Demon's Souls is hard because of this, but we never made the difficulty needlessly high for the sake of being hard, nor did we intend for it to be a selling point," he said. Steep difficulty can be appealing. Take the case of indie action-adventure title Spelunky, where the sense of discovery and achievement is maximized by stiff odds. "I think that a tough challenge can make a game much more enjoyable," said creator Derek Yu. "Don't we feel the most fulfilled when we overcome something difficult? Without that feeling of getting better, a game turns into a chore - something that you do as a distraction rather than something you do for fulfillment." The key to effective difficulty, as opposed to frustration that's just frustrating, is all in the implementation. "Doing something hard isn't fun in and of itself," said Yu. " It's not fun to sit in an empty room and try to balance a ball on your head for 10 hours straight. To make challenge effective, you have to provide an interesting game world and create deep mechanics that are entertaining to play with and very satisfying to master." Nels Anderson, gameplay programmer at Hothead Games, also feels it's important to delineate between frustration and meaningful challenge. "Being frustrated usually means the player cannot determine a way to improve or progress," he said. "Part of the reason Demon's Souls works so well is because you understand why you failed." 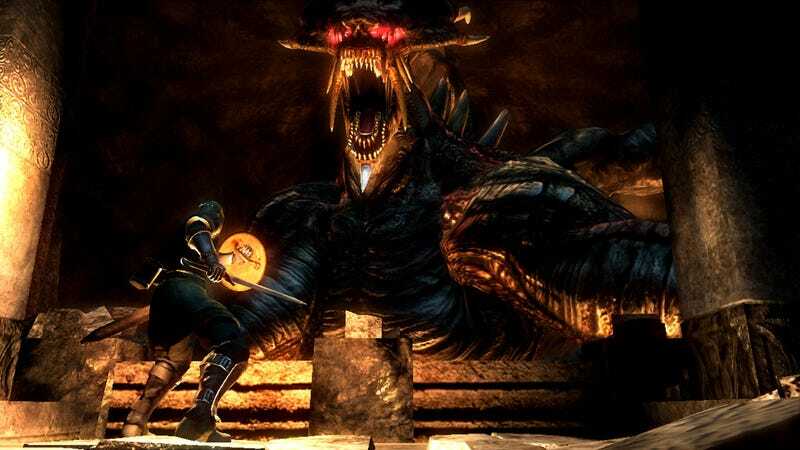 Demon's Souls' Kajii says that failure needs to be an ever-present possibility if the player is to feel a sense of accomplishment. "We designed it so that players are likely to die if they aren't paying attention," he says. "By maintaining this intensity, players will be constantly nervous while playing, but [will feel] a tremendous sense of accomplishment is their reward for doing so." Achievements are more valuable, then, when there's a lot at stake – and failure is less frustrating when it's clear to the player where they messed up. "Demon's Souls is a game where you ‘die a lot,' but as I've already said, it is geared so that you will acknowledge that it was your own fault," said Kajii. "Players will keep playing because they know they can get past a certain point by taking a different approach, using their imagination, and thinking about how to overcome obstacles." In a game like Demon's Souls, then, a frustrating death is simply the game informing me that my strategy didn't work. The mechanics are such that I can't blame the game, and my failures never feel unfair. I can then tackle the exact same obstacle with a different approach, until I figure out a tactic that will help me succeed – and victory's all the sweeter thanks to all of my struggles on the way. "Dying in a video game is like losing a tennis match, or getting rejected when you ask a girl out, or looking at a painting and not understanding its meaning. You'll always learn something and the next time will be better," said Yu. He says that if dying's fun, that makes it all the better – and Demon's Souls also features an interesting twist on death. Enriched by its multiplayer element, the game allows players to see the bloodstains of other fallen heroes, and touch them to view how they died. Players can leave notes and messages for one another warning of tough spots up ahead, and can also recruit the phantoms of players that have died to help them handle challenges. Kajii says this system of strangers helping strangers came from a real-life experience of his, a time when his car was stuck on a snowy mountainside. Numerous stranded drivers all banded together to push each of the cars in turn, but Kajji couldn't stay behind to thank his benefactors, lest he end up stranded again. "I wondered about things like whether the last person made it home, whether I'd ever meet the people who helped me again... Maybe if I'd met them somewhere else, I would've made friends with them... Many thoughts crossed my mind," he said. "This occurrence of helping complete strangers was strangely very memorable, and I kept thinking about it for a very long time. "Demon's Souls is a game where you die many times, so I thought this idea of helping others would be a great fit. It's as simple as, ‘We all die so easily, so let's help each other out,'" he adds. "Unlike other RPGs, each player unfolds their own story, and each encounter with a phantom player expands and diversifies their experience." Designers are right to be concerned with players finishing fewer titles, and they're right to offer low barriers to entry for expanded audiences – to a point. "I think in an attempt to avoid frustrating players, the baby often gets thrown out with the bathwater in terms of difficulty," said Hothead's Anderson. "It's a pretty common misconception that players want easier games." He paraphrases some research from Jesper Juul of MIT's Gambit Game Lab: "Players are more critical of a game that's too easy than one that's too hard. The player can improve and make a difficult game fun, but short of handicapping oneself, there's no way to make a game that's too easy harder," Anderson continued. "However, as soon as players feel they don't have any way to improve, their assessment of difficulty turns much more negative." Frequent death and frustration don't need to be viewed as engagement-breakers in games – as long as the deaths are meaningful and educational, and as long as the player's frustrated with themselves, not the game. The most important factor is clearly that players must be able to see what they can do differently to surmount a challenge. The tactic that finally gets me over a bridge swarmed with archers, or through a narrow hallway packed with vicious wolves, might not be the same one that works for another player, but it's one I've developed on my own, through trial and error, experimenting with the environment and with my own abilities. "This act of trial and error in a tense atmosphere is the heart of challenge and discovery, leading to the strong satisfaction of accomplishment," says Kajii. "I'd say Demon's Souls is not a ‘fun game,' but a ‘game to have fun with,'" says Kajii. "The goal is not to find a pre-defined answer — instead the answer is something created by the player on their own through their own play-styles."